It's fall! Although it hasn't felt like it here in Virginia, I have been slowly planning and shopping for my fall wardrobe. 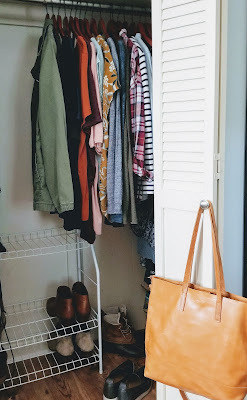 I am excited about the thoughtful things I have added this year and wanted to share my simple fall closet with you. First off, a very real peak into my half of the closet. I moved my summer things to the back and brought the cool weather pieces forward. For the last several years I have been working on decreasing the size of my wardrobe. 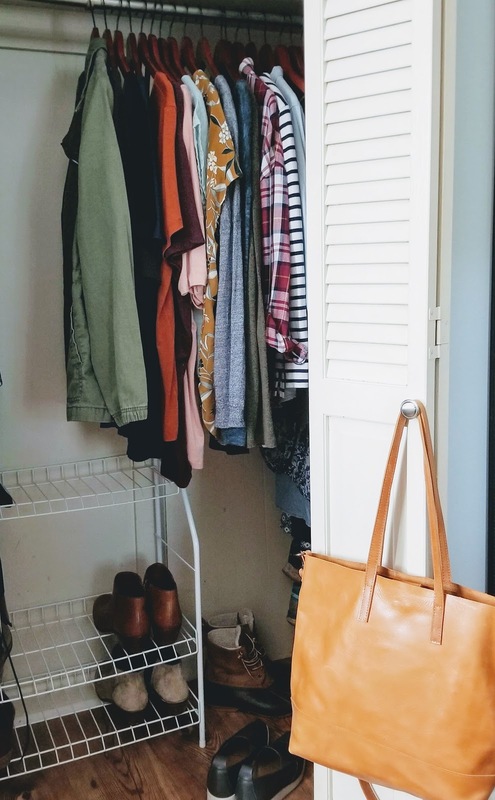 When we lived in Nebraska I had a walk-in closet filled to the top, a dresser, and totes under the bed for off season clothes. Now I share a small closet with Chad and have my dresser which holds both on and off season clothes. In the last twelve months since my fibromyalgia diagnosis I have needed to replace a good portion of my wardrobe because of weight gain. Most of my too-small clothes have been sold or donated so our closet isn't packed full with things that no longer fit. What I am left with is an edited closet of things I like and feel the best in. As I have been replacing things, I have focused on buying secondhand and from companies with sustainable and ethical practices. Buying secondhand gives me many more options for making my clothing allowance stretch. I can buy higher quality without the huge out-of-pocket expense, brands I wouldn't normally buy, or whose business practices I disagree with. My friend, Karin, at Truncation wrote an excellent blog post about shopping secondhand. There is more than one way to be ethical and sustainable in your clothing purchases, and thrifting is an excellent option for those who can't buy exclusively from ethical companies or small makers. This season, over 70% of new things added to my wardrobe have been bought secondhand. I also have invested in some high quality pieces from companies with high ethical standards. While I would love to revamp my entire wardrobe with items from these stores, the cost is prohibitive. This fall, I chose three new pieces, one of which is leather that will not be affected by my ever changing weight fluctuations. The other two are loose/flowy, so it will allow my size to change in either direction and still fit. My style is simple because I don't work outside the home. I have a few nicer things I wear if Chad and I go on a date or have an event at the University, but the majority of my clothes are meant for my life working from home, running errands out in the community, and my occasional travel. I want to buy what's practical for my lifestyle while honoring my conviction to buy from sustainable retailers whenever possible. So here is what I added and will be wearing this fall. These pieces, added to the few things I bought over the summer and last winter, makes a wardrobe perfect for my lifestyle. ABLE provides economic opportunities to women in Ethiopia, Mexico, and Peru and is making it their mission to end generational poverty in these areas. In areas where prostitution is prevalent, ABLE provides women with a way to earn a living and empowers them to end the cycle of poverty. I am proud to own two of these bags and to know I am supporting such a business! For those of you who haven't ever shopped with Able before, here is a $20 coupon. My next purchase was a silk top from Amour Vert in a pretty fall gold. Since it stays warm for so long in Virginia and we will be celebrating Thanksgiving in Phoenix, I decided to go with a short sleeved top for my "statement piece." It looks pretty layered underneath a cardigan as well for chillier days. It will be able to be dressed up or down throughout the season. 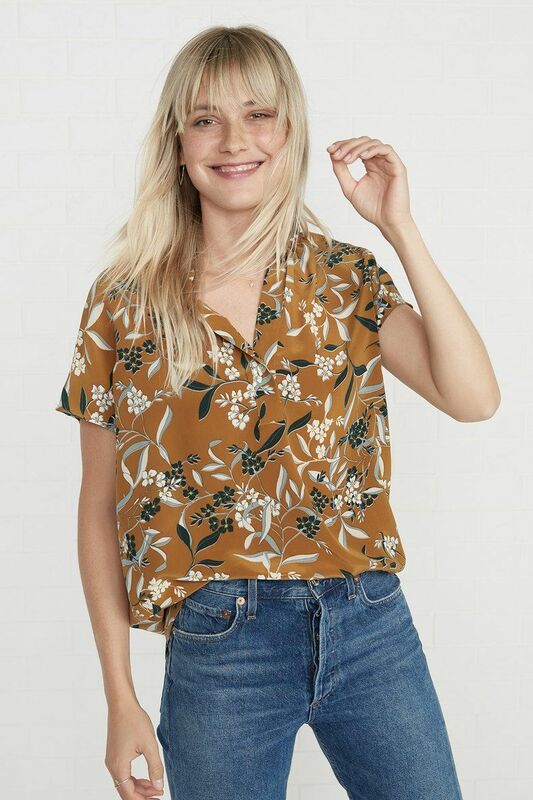 This top was made in the USA and the silk was produced at a family owned, sustainable factory. I usually buy a new sweatshirt every year or two and spend most of late fall and winter in it. This year I chose a cute slouchy one from Pact. I will wear it to yoga, for walking Mocha, and for quick trips to the grocery store, or rainy Sundays binging on Netflix. I spent less on this sweatshirt than if had I bought Nike or Under Armour as I did in the past, and Pact's cotton is certified organic and is produced with fair trade practices. 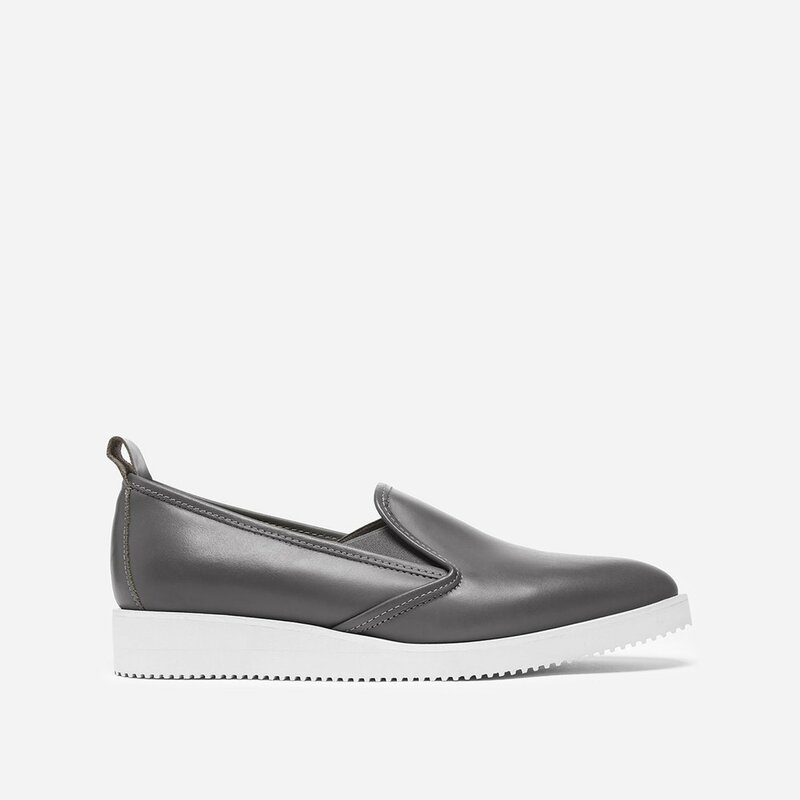 I had wanted to buy the Everlane Street Shoe, but when I decided on the ABLE bag as my big purchase, I decided to just wear my sneakers from a few years ago. That is until I found the a hardly worn pair of Street Shoes used on Poshmark for two-thirds less! Finding an ethically produced item secondhand is exciting! I bought three secondhand wool cardigans on eBay and Poshmark to replace my Target cardigans I've had since 2012. I also found the J Crew merino wool and linen sweater below on Poshmark. For less than the price of one new sweater I added these four high quality, almost new sweaters! That is thrifting at its best! While I try to stay away from fast fashion as much as possible, I still occasionally shop there. Target's A New Day line has awesome t-shirts. I have tried tees from sustainable fashion retailers, organic cotton retailers, and many fast fashion stores. Target's beat the other hands down. They drape beautifully, wash and wear well and do not stretch out.....and you can get 2 for $14. I am comfortable with these because I know how great they will wear and amount of use I will get out of them. I bought the rust and the gold color. I also own them in black and burgundy from last year. I'm still on the hunt for an ethical equivalent, so please share if you know one! You noticed I didn't buy any pants.....Well, I did buy two vintage pairs of men's Levis on eBay, but I haven't decided if I can pull off the style so they may be resold. Over the summer I kept an eye on eBay and got a great deal on two almost new pairs of jeans. I also bought two button down shirts at local thrift stores for $2 each. Those, with the few things I bought last fall/winter makes me mostly set for the colder months. The only thing I would like to add eventually is a pair of minimalistic rain boots, like these from Alice + Whittles. I have duck boots, but some rainy days you want to be dressier than duck boots! This was a pretty hefty amount of clothes compared to what I usually try to buy in a season, but most of my colder weather clothes were either too small or very worn. Even my shoes were seeing wear as I only own a handful, so they are in constant rotation. I took a big stack of too small clothing into the consignment store, so my out-of-pocket money will be less once they sell. I also used coupons and sales to buy the new things I added, so nothing was bought at full price. I am happy and feel like this was a well thought out and well rounded investment. I keep track of all my clothes, shoes, and bags on a spreadsheet, including those that no longer fit that I'm keeping...... (a handful of favorites and a few with sentimental value). I make note when something needs replaced because it's worn out, new things I buy, where I get them, and what each item costs. This helps me get a better picture of what I need, how much I've spent and who I'm giving my dollars to. So there you have it! I encourage you to shop secondhand if you are wanting to dip your toes into sustainable fashion. It really is the most sustainable form of shopping! If you have the money to shop from ethical retailers, ABLE, Amour Vert, Everlane, and Pact are a great place to start. I am planning a blog post on sustainable cleaning where I will give my all natural cleaning tips, cleaning tools, and how I care for my clothes. See you soon! While this is not a sponsored post, the coupon links above will benefit me as well as you, should you choose to shop with the companies I suggest. Rest assured, I only suggest products I love and use regularly.